Every day I take my bike out, I try to be a better rider. Each day I try to learn something new. Each day I try to baptize myself towards riding the mighty liter. So, in that effort, one of the most crucial thing one needs to learn before riding any higher capacity bike is to Counter Steer. So, what is Counter Steering?? As per Wikipedia - "When riding a bicycle or a motorcycle, countersteering is a method of initiating a turn by a small, momentary turn of the front wheel, usually via the handlebars, in the opposite (counter) direction." Tough definition!! What we are trying to achieve here is the Lean!! In order to make a well balance turn, we need to LEAN the bike into the turn. But what's the correct way of leaning the bike into the turn?? So, basically we are playing with the Centrifugal force acting on our bike which has a tendency to throw the bike away from the direction of the turn. So, in order to Counter that we unbalance the Centrifugal force away from the direction of the turn, by slightly turning the bike in the opposite direction of the turn, and then turning it back to the direction of the turn. 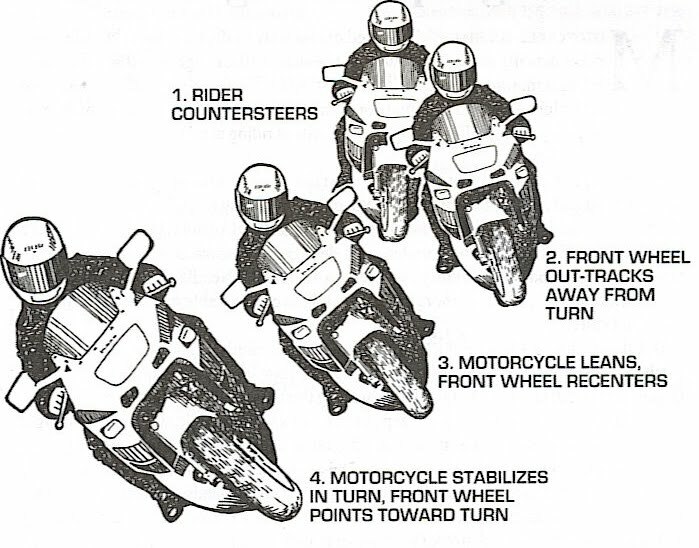 1) As you approach the turn, turn the front wheel of the bike slightly to the Right, so that the Centrifugal force allows us to lean the bike towards the Left, i.e. the direction of the turn. 2) Once we are into the lean, then we can turn the bike INTO the turn and maintain the lean angle, else the bike would continue to lean with gravity. 3) The same process of counter steering is needed to be applied while exiting the turn. But at the same time, we must keep in mind that depending on the road conditions and the condition of your tires, gaining too much lean angle can be very dangerous. So, if your tires are kinda worn out or there is wet patch, gravel or sand around the corner, be very very cautious with your lean angle. Thanks for sharing the link bro!! Really awesome read. I am the anonymous one, forget to sign that one. Nice.. the illustration was specially worth a thousand words. Fortunately, keeping up your directing framework is a simple activity at home. Dealing with your influence controlling framework won't just spare cash on gas, it will likewise lessen your repair charges over the long haul.